Although motorists often complain that some drivers don't know they exist or how to use them, all cars these days come equipped with blinking turn signals letting the car behind you know what you're up to. That certainly wasn't the case with the earliest cars, though. I still remember drivers using standard hand signals into the early fifties — you know, the ones you had to learn to pass your driver's test: for left you put your left arm straight out the window parallel to the ground, for right you rested your left elbow on the window, raising your forearm up with your hand open. And if you wanted to stop you signaled that intention, as well, by putting your left arm out parallel to the road and angling it downward. These hand signals were required whether it was sunny and fair or pouring buckets. Drivers of early historical cars, in fact, still have to know and use hand signals. So, why didn't someone come up with a solution that would lead to greater safety and comfort for the motoring public? Well, several "someones" did just that — and early on. In 1907 Percy Douglas-Hamilton applied for a patent (received in 1909 as U.S. patent 912831) for a device "indicating the intended movements of vehicles". Apparently the lights were shaped like hands so other drivers, accustomed to reading hand signals, would understand their meaning. Fast forward to 1914 when silent-film star Florence Lawrence designed (though failed to patent) a mechanical signaling arm. (Note: she also designed the first mechanical brake signal and her mother Charlotte Bridgewood patented the first automatic windshield wipers). As the driver pushed a button, a sign on the rear bumper came up telling others which way the driver would turn. According to the December 1985 issue of Popular Mechanics, the Protex Safety Signal Company introduced flashing turn signals in 1920. The first modern turn signal, though, can be attributed to Edgar A. Walz, Jr. who, in 1925, secured a patent for one and tried to market it to major car manufacturers. They just weren't interested, and the patent expired fourteen years later. Meanwhile drivers and inventors kept working on other solutions. The Smithsonian now has a handmade, one-off signal, for instance, that Oscar J. Simler made in 1929. It had a four-lobed shape with lenses for lights indicating slow, stop, left or right turn. Oscar J. Simler's handmade turnsignal. The European remedy for signaling turns or lane changes offered drivers semaphore indicators, mechanical arms known as "Trafficators" that swung out horizontally. These were powered by electro magnets used to raise an arm (usually mounted high on the door pillar) indicating a turn was about to be made. Once these arms were in the "on" position, power went to the lens area, lighting a small bulb. When they were "off", the trafficators folded into the door pillar. This allowed drivers to keep their hands on the wheel, a step up when it came to safety. Although Ford was not offering turn signals on U.S.-made cars, for German-built Model A's trafficators came factory-installed. Scintilla, a Swiss firm, manufactured a number of these, and they had left-side and right-side models. The driver's toggle switch used to activate the arm was mounted in the center of the dash. While Ford did not produce this component, some versions came complete with the Ford logo. Trafficators had actually been around long before the Model A, and their shape is said to resemble the signal arm used by trainmen of the Royal Bavarian Railway since 1890, though about half that size. First appearing in the early 1900s they had several fathers. Italian Alfredo Barrachini in 1908 added electric lights to a cable-activated system. In 1918 the Naillik Motor Signal Company of Boston added electric motor drive. For slow or stop a switch in the brake pedal activated hands that swung out on both sides of the car. For left or right turns separate switches were operated from the clutch pedal. At night the small hands were illuminated. 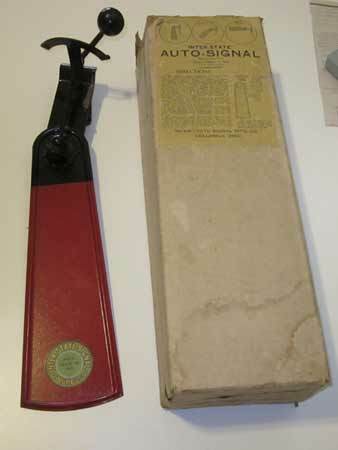 In 1923 French inventors Gustave Deneef and Maurice Boisson utilized a linear solenoid and in 1927 Germans Max Ruhl and Ernst Neuman added internal illumination to the solenoid operation. 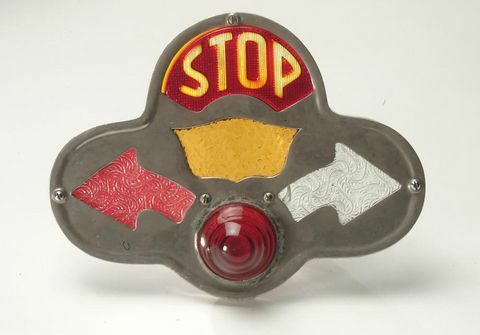 As more modern turn signals were introduced, trafficators were phased out. Many drivers thought that a good thing, especially since trafficators were fragile, often broke off, and tended to stick in the "off" position. Back in the States, Buick was the first U.S. automaker to offer factory-installed flashing turn signals. Introduced in 1939 as a safety feature, the new-fangled feature was advertised as the "Flash-Way Directional Signal" operated from a switch on the new "Handi-shift" column-mounted shifter. The flashing signals only operated on the rear lights. In 1940 Buick enhanced the directional indicators by extending the signals to front lights and adding a self-canceling mechanism. That year directional signals became standard on Buick, Cadillac, LaSalle, and the Hudson Country Club vehicles and optional on Chevrolet, Oldsmobile, and Pontiac (for a cost of $7.95), Hudson (for $10), and Packard. In 1941, Dodge offered turn signals as an option on all its models. After WWII turn signals and turn signal levers mounted on the left side of the steering column became more commonplace. For those cars without them, however, the Illinois-based Lester Company offered a Simplex Direction Signal Kit for '42 to '49 models, advertising that the signals available for $8.95 would work "like factory-installed models on expensive cars". In 1951 the average American family income was less than $4000 a year. As little as that now sounds, it was enough for many families to invest in more luxurious cars, partaking of options available for more powerful engines, two-tone paint, and even turn signals. Nowadays turn signals are required for vehicles driven on public roads — unless they're antique vehicles that did not come with turn signals. Some owners of such cars, though, feel a lot safer installing after-market turn signal mechanisms. The sixties brought other innovations to turn signals. Initial plans called for Ford to install sequential rear turn signals on the 1964 Thunderbird but installation was put off a year while legislatures across the country considered whether to make them legal. In 1965, however, they were factory fitted on Thunderbirds, soon followed by Mercury Cougars (1968-1970), Shelby Mustangs (1968-1970), and 1969 Chrysler Imperials. After the turn lever was activated, lights came on in sequence from the interior bulb, to the middle bulb, to the outside bulb. Then they all clicked off and the sequence repeated itself. 1968 marked another change: Federal Motor Vehicle Safety Standard 108 required amber (rather than the earlier white) lens front turn signals; rear signals could be red or amber. Note: It was also in the sixties that 4-way hazard flashers were first required. Reliable light-emitting diode (LED) technology for signal lights was introduced in the 1980s. Because such lights do not depend on lens color, they emit true red and amber hues. While it hasn't happened yet, it may not be long before filament bulbs have been phased out completely. With the 2011 Fiesta Ford adopted technology from Audi and VW and installed three-blink turn signals. When you signal a turn, lights blink three times then shut off automatically. If you need them on longer you move the lever up (or down) another position. This feature should alleviate frustration other drivers feel when a turn signal is unwittingly left engaged. Though the basic turn signal technology hasn't changed in years, future improvements may include increased strength and durability for parts that are consistently used and abused, an alert when the turn signal switches off even before we've started our turn, and customizable turn-signal tones. While there's still a need for such innovations, we're all better off relying on technological wizardry rather than hand signals.